PHILADELPHIA – Irfan Yusuf and the Canberra Times have issued an apology to Daniel Pipes, director of the Middle East Forum, concerning a defamatory article written by Yusuf. predicted Europe's next Holocaust victims would be Muslim migrants. Frighteningly, Pipes suggested that Muslims thoroughly deserved such slaughter. 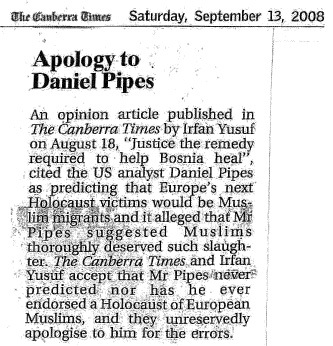 The Canberra Times and Irfan Yusuf accept that Mr Pipes never predicted nor has he ever endorsed a Holocaust of European Muslims, and they unreservedly apologise to him for the errors. So sorry about accusing you of wanting a second Holocaust, Mr. Pipes. It was an innocent mistake. We hope you understand. In a more serious vein, Mr. Pipes responded that "Irfan Yusuf has a history of writing inaccurately about me, something I have already noted and corrected. His having embarrassed the Canberra Times should send a signal to responsible media everywhere to decline his tendentious writings." Brooke Goldstein, head of the MEF's Legal Project, added that "It is unacceptable for a newspaper to publish defamatory lies about Dr. Pipes. It is encouraging, however, that the Canberra Times and Irfan Yusuf have acknowledged their error."